Our U11 & U12 Girls--premier & club--have team training every Wednesday, November through April. In addition to this, they have optional Skills Sessions on Saturdays and futsal (5v5) games on Friday evenings. Please find their complete schedule for the winter months below. The 2007 Premier, 2008 Premier, and 07/08 Girls Club teams will each have 1 team training session a week. 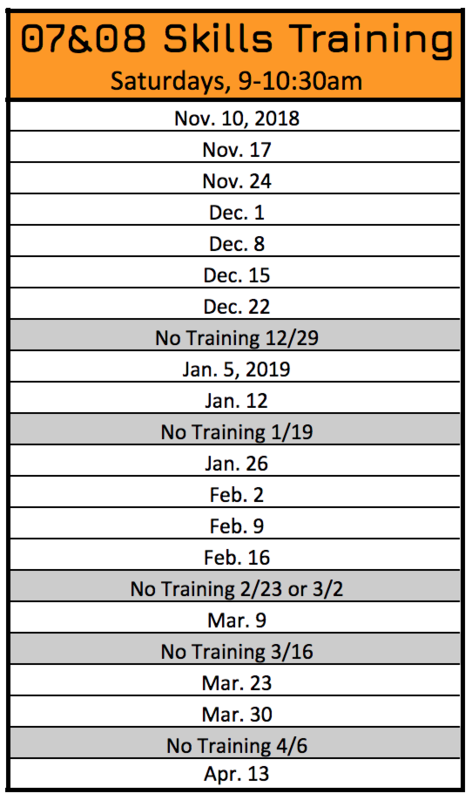 In addition to team training, all 07 & 08 players will have an additional Skills Training, which focuses on developing individual and small-group skills and concepts. These are optional, but encouraged. The 2007, 2008, and 07/08 Girls will all enter teams into the Far Post Futsal Leagues. Your team manger will have sent information on this and will sign your team up. You can find the schedule under the INDOOR LEAGUES tab on our website navigation bar, then click LEAGUE SCHEDULES & RESULTS.